If there was a Mount Rushmore for the founding fathers of rock there's no doubt that Mr. Jerry Lee Lewis aka "The Killer" would be up there carved in stone. He is already enshrined in Cleveland as part of the inaugural class at the RRHOF. When Skyville Live hosted a tribute party in his honor on Thursday, August 24, 2017 the question on everyone's mind was whether or not an induction into the Country Music Hall of Fame was around the corner. Chris Stapleton is joined by the McCrary Sisters in Nashville. Jerry Lee Lewis made his first recordings at Sun Records in Memphis, Tennessee and scored two major hits with "Whole Lotta Shakin' Goin' On" and its follow-up "Great Balls of Fire". He is considered a pioneer of rock and roll and rockabilly music and he proudly wears the moniker of rock's first great wild man. Still, he over-stepped the boundaries of a conservative nation when he married his 13-year-old first cousin once removed when he was 23 years old and his music career began to falter. The Killer re-emerged a decade later when in 1968 he made a transition into country music. He had many hits beginning with "Another Place, Another Time" and throughout the late 1960s and 1970s he regularly topped the country-western charts with 30 songs reaching the top 10 in that time. So, it was with the help of Skyville Live and a pantheon of country music gods including George Strait, Chris Stapleton, Kris Kristofferson and Lee Ann Womack that a strong push to get Lewis recognized in the Rotunda on 5th Avenue began in Nashville. "You have no idea how good a country singer Jerry Lee Lewis is," said Toby Keith after pouring out a spirited and rocking take on "Wine Spodee Odee" during his three song portion of the night, before continuing, "He's in the Rock n Roll Hall of Fame, he ought to be in the Country Music Hall of Fame". 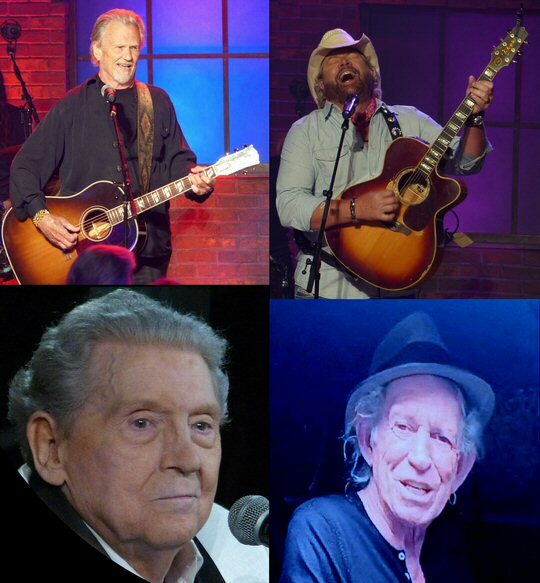 Kris Kristofferson, Toby Keith, Keith Richards via video and Jerry Lee Lewis. The Music City recognition continued by honoring the icon on August 24th - which was also commemorated as "Jerry Lee Lewis Day". 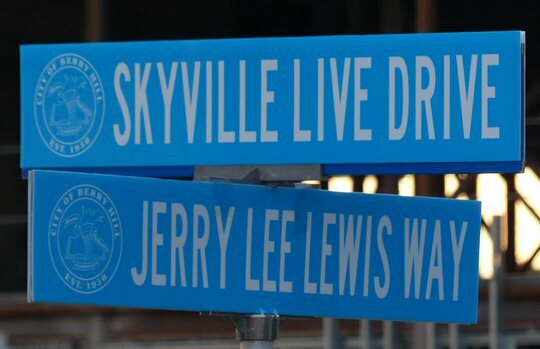 The city renamed Skyville's Live's home intersection for the day, changing Westwood Drive to "Jerry Lee Lewis Lane" and Inverness Avenue to "Skyville Live Drive" to celebrate his legacy, including his lasting impact on Nashville and country music. The least known artist of the night was arguably the most charismatic as Waylon Payne got the proceedings off and running with a jolting "Lewis Boogie" that found the musician and actor jumping on top of his piano to bring the song home. During a pre-show red carpet interview the happy and humble Payne talked about bringing honesty and respect to the role when he portrayed Jerry Lee Lewis in the blockbuster Johnny Cash bio-pic Walk the Line. Other highlights included Chris Stapleton, who was taken aback just a bit by the "intimidating front row", and his traditional gospel number "I'll Follow Him" with help from a quartet of back-up singers known as the McCrary Sisters. Lee Ann Womack thanked Jerry Lee who was sitting in the front row for the influence on her music before playing an intoxicating rendition of "What Made Milwaukee Famous". Everyone in the audience then had a chance to drink in the moment when the honoree joined the cast for a house-shaking, show-closing run through "Whole Lotta Shakin' Goin' On" that brought the Nashville faithful to their feet. Skyville Live is where the streets have new names in Nashville. 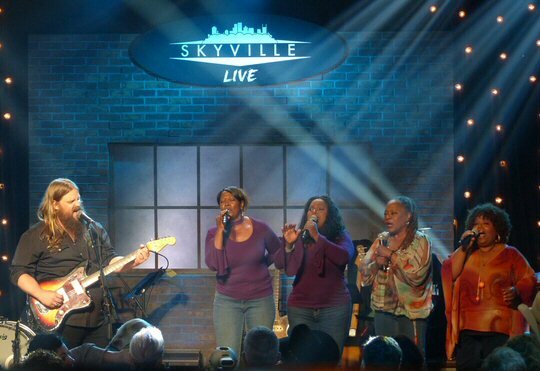 Skyville Live has been slowly gaining recognition in Music City since launching in 2015. They have hosted a number of one of a kind special events that have included stellar performances by Gregg Allman, Gladys Knight, Martina McBride, Billy Gibbons, Dr. John, Cyndi Lauper and Jason Isbell to name just a few. But, since their attendance is limited to the relatively small group of industry VIPs and contest winners that their soundstage can hold a good portion of Nashville has yet to discover their work. We asked co-founder Wally Wilson if this evening's extravaganza was the one that just might cement the live-streaming showcase as an institution in town. "That's what my wife says," said Wilson holding back a smile. "She says this is the tipping point. We started out very organically. I didn't even consider making a big splash in Nashville since we were an online series. Nashville is just now aware of what we are doing and the world (via the online stream). We are full of a promise for what the future holds. We want to be on all screens." With the unprecedented Jerry Lee Lewis tribute now complete Skyville Live has taken a giant step forward. The local media in Nashville was buzzing in advance of the concert that was to feature amazing country music legends honoring a founding father of rock known as "The Killer". They have now clearly carved their way into the crowded consciousness of Music City where there's always a slate of events vying for the public's attention. It will be interesting to see where the monumental series goes from here as they curate top-level talent for even more unscripted and historic musical moments in the future. 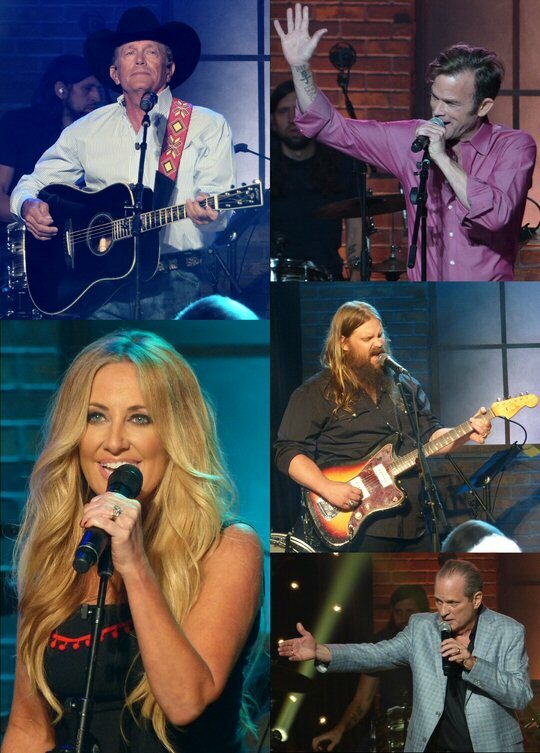 George Strait, Waylon Payne, Chris Stapleton, Wally Wilson and Lee Ann Womack.